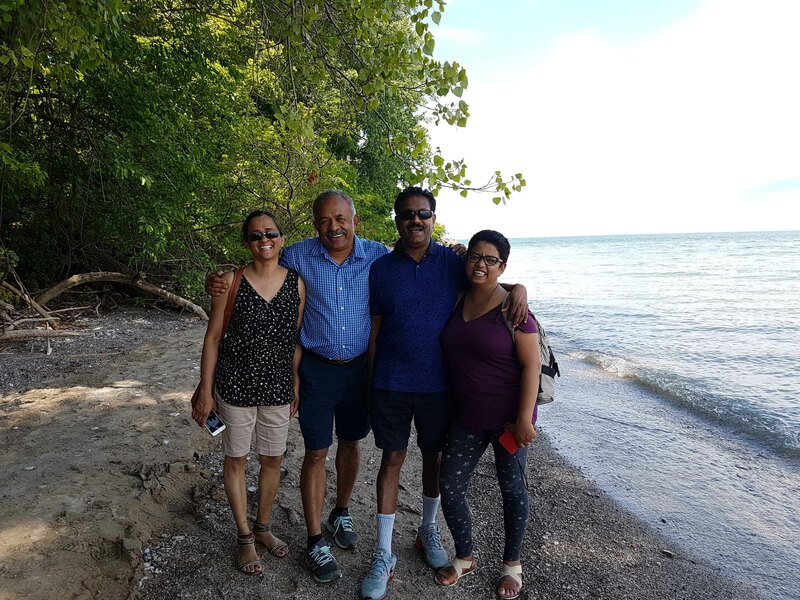 On July 08, 2017, we along with Stephens, our travel companions, travelled from Toronto to Lemington, a four hour car drive along Highway 401. 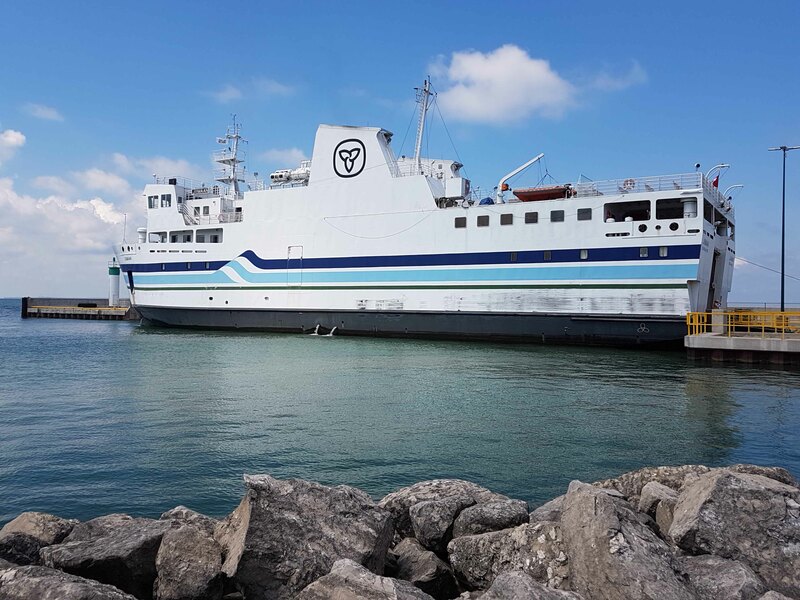 We boarded MV Jiimaan, a vessel 200 ft)in length that transports 400 passengers and 40 vehicles on Lake Erie from Lemington to Pelee Islands. The cruise was of about 90 minutes. The ferry housed a cafeteria and the view from the deck was awesome. Pelee Island, (42 Sq Km) largest island in the Western End of Lake Erie, is the Southernmost tip of Canada. It was leased to Thomas McKee by Ojibwa and Onawa tribes in 1788. The island’s name is derived from a French word ‘pelee’ meaning barren. It remained barren, true to its name until it was purchased by William McKormick in 1823. 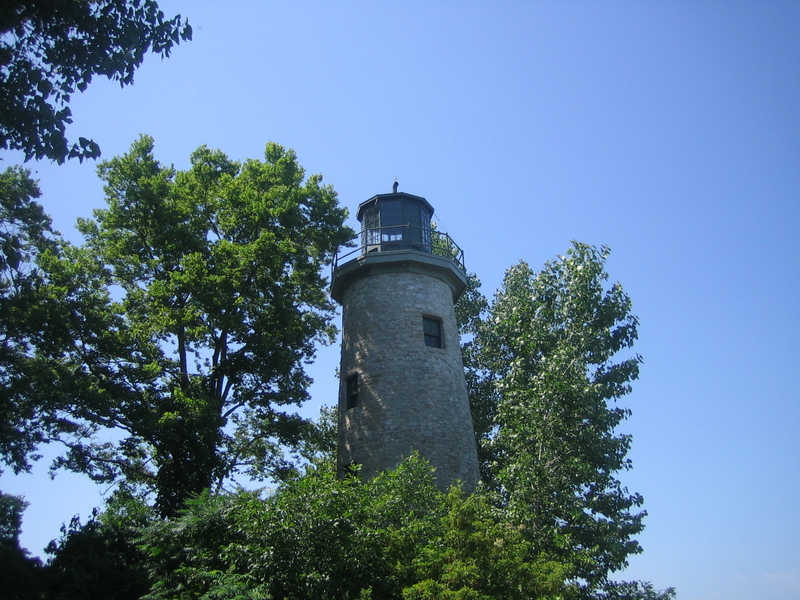 The Pelee Island Lighthouse was built by John Scott in 1833. William McCormick donated the land and also served as its first light-keeper till 1840. 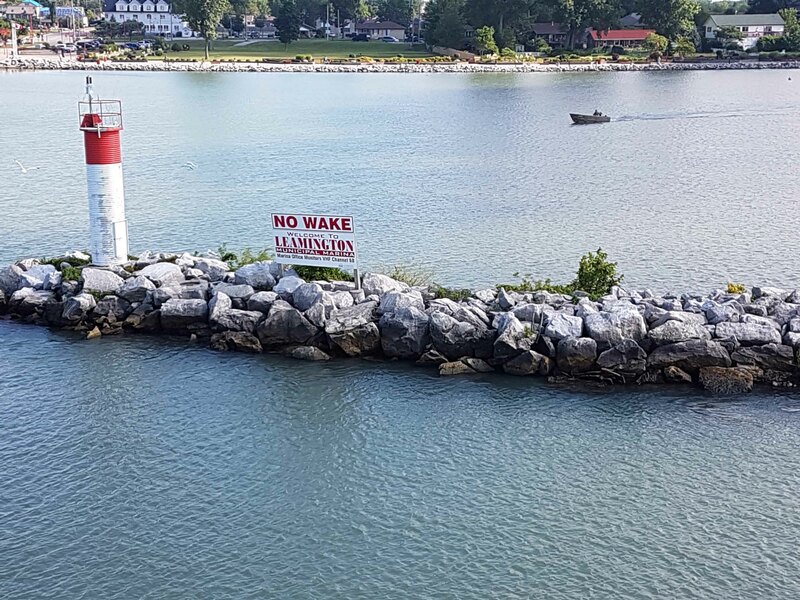 The lighthouse used to guide sailors through the rocky Pelee Passage. in the Erie Lake until it went out of service in 1909. 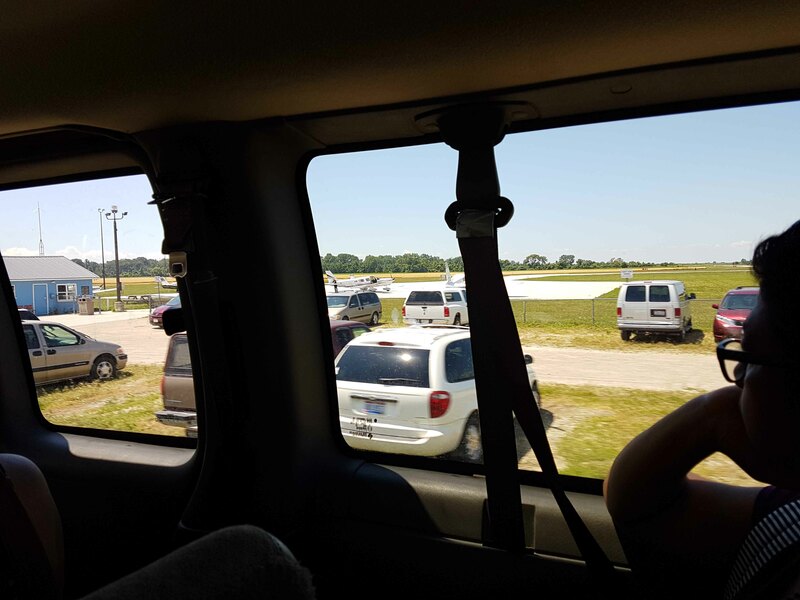 The only other way to get on to the Pelee Island is through the International Airport with a 3,300 feet paved runway. Regular flights operate in winter when the ferry services are closed. It serves as the emergency pickup point. It might be the smallest International Airport in Canada – it is International as it receives flights from USA, just South of it. 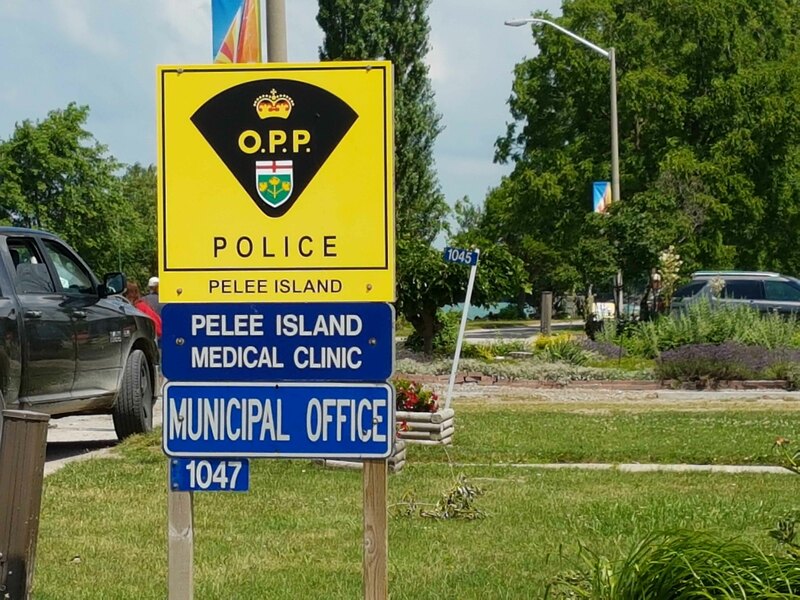 The population of Pelee Island is about 140. In summer about 100 migrant workers land on the island to support both tourism and agriculture. The island has a Police Station manned by two personnel, obviously there is hardly any crime and the last major crime was reported in 1920. The Emergency Services is operated by two Para-Medics with an ambulance and a Nurse Practitioner manning the Medical Clinic. Emergency cases has to be airlifted to the mainland at Lemington. The Fire Department has a fire tender operated by volunteer crew. This is the shoe tree which has an interesting history. 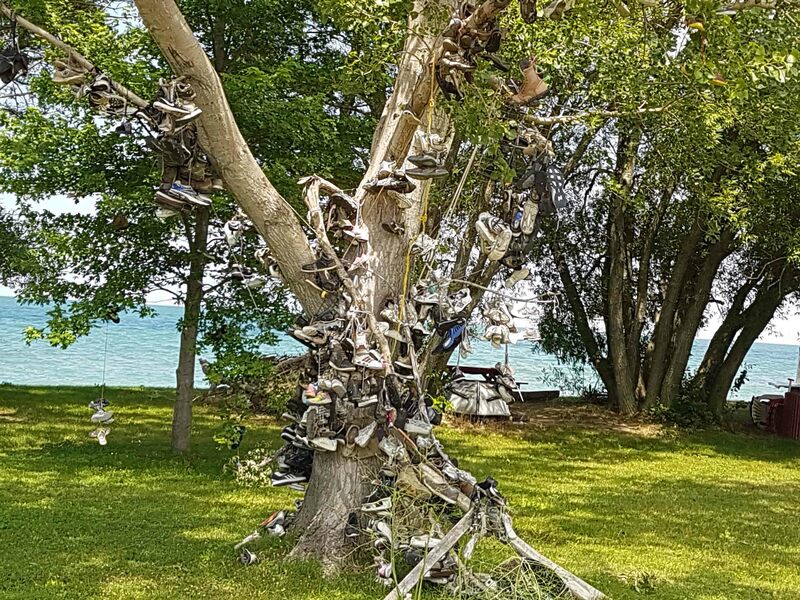 The tree was given up for dead and the home owner tied a pair of shoes on to it and it is believed to re-grow thereafter. All the migrant workers, on leaving the island at the end of the season now tie their work-shoes on the tree to bring them good luck. The island is mainly agricultural based with about 5,000 acres of soybeans, about 1,000 acres of wheat, 500 acres of grape cultivation. The centre of the island was a large marsh which was drained out to form the fertile agricultural land. Thus most cultivation is done below the Lake’s level and hence there is always fear of floods. The houses on the island are built on stilts to save them from flooding. After spending the day on the island, we boarded the ferry on our return voyage to Lemington and then we drove off to Toronto. Mein ne pee lee. Good one, Reji. Very informative Col Reji. A virtual visit to the island!